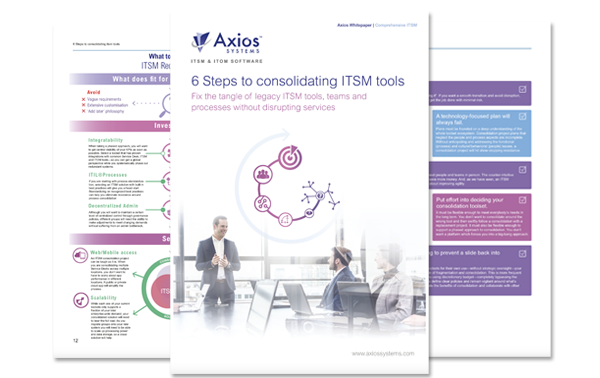 Whatever the reason an organization has acquired a tangle of ITSM tools, the symptoms are the same: duplication of data, processes, admin, integration and upgrade efforts. When you’re running multiple IT management solutions, you’re likely to be overspending on licenses. Typically, we find that customers consolidating their ITSM tools half their license spend. As a highly visible and quantifiable benefit, license savings are a clear-cut driver for consolidation in the eyes of the CEO and the CFO. Many legacy ITSM tools have complex licensing models (versus modern, all-inclusive models) which add up to a significant admin burden for the finance department. Toolset sprawl is a form of waste, so a consolidation project is a classic waste-elimination exercise. Duplicated (and unplanned) maintenance, administration, integration, upgrade and security overheads consume budget and distract IT people from delivering real business value. Consolidation simplifies application management and eliminates large overheads, releasing time and budget for innovation. Organizations with multiple ITSM tools don’t get central visibility of what’s happening across IT. With multiple systems in place, the job of aggregating and preparing data for analysis can be a complex and time-consuming task. The more data sources you have, the more difficult it is to make data-driven decisions. A consolidated solution can provide one-click access to business analytics covering the business perspective, technical level and everything in between—right out-of-the-box. When different teams use different systems, they get different perspectives of IT and nobody sees the whole. Consolidation establishes a global view, eliminates the silo mentality, and re-orientates teams to focus on the performance of IT as a whole. When IT people see the bigger picture, it promotes a cultural shift which reduces conflict between teams. Technology silos are also knowledge silos. Consolidating the information and knowledge that is fragmented across multiple systems means IT people waste less time solving problems when a solution already exists. Easy to access to knowledge is critical to getting things done fast, so an effective Knowledge Management system can quickly level-up productivity across your service delivery and support processes. Selecting a tool that supports Knowledge Centered Service (KCS) processes and enables contextual links between IT records and knowledge artefacts will help organizations leverage knowledge at scale to achieve greater performance. Ensuring license compliance is never easy, but it is even more difficult in the aftermath of a merger or acquisition. With multiple IT management and service management applications in place, the risk of non-compliance is also multiplied. Consolidation reduces the number of applications which must be continually monitored for compliance (and defended in the event of a vendor audit), meaning licenses are used more efficiently. In situations where multiple solutions are in place, vendor salespeople know that consolidation needs to happen sooner or later, so their approach can be polarized; either fighting hard to be the vendor that stays or resigned to the fact that another toolset will win out. After consolidation, the dynamic changes and a closer, more constructive vendor-customer relationship emerges. In the meantime, your accounts team will be bogged down with the added burden of negotiating renewals, verifying invoices and billing payments.